Last month, I wrote a post about a new bug in Mac OS X 10.6.3 that is preventing some people from exporting their timelines. I wanted to publish some more technical information for the customers who would like some more detail as well as other developers who may be also experiencing this behavior. In Mac OS X 10.6.3, there are certain Quartz Composer documents (compositions) that crash the host application when run on a machine with the Intel GMA 950 graphics card (GPU). For example, when Finder tries to create a QuickLook preview of these compositions, Finder will crash and reboot. A Quartz Composition that modifies a bitmap image and then displays a bitmap image using a mipmap. These can be the same image or two different images. I'm not sure if this bug is confined to Quartz Composer documents or if it also affects applications that are accessing the OpenGL framework directly. If anyone knows, please leave a comment. In Bee Docs Timeline 3D, the full screen presentation mode is actually a separate application from the application that allows you to create and edit timelines. If your computer is affected by this graphics bug, pressing the "3D" button will fade out your screen, launch the presentation application (which will crash immediately), and then the screen will then return to the main program. The bug also prevents 3D exports. 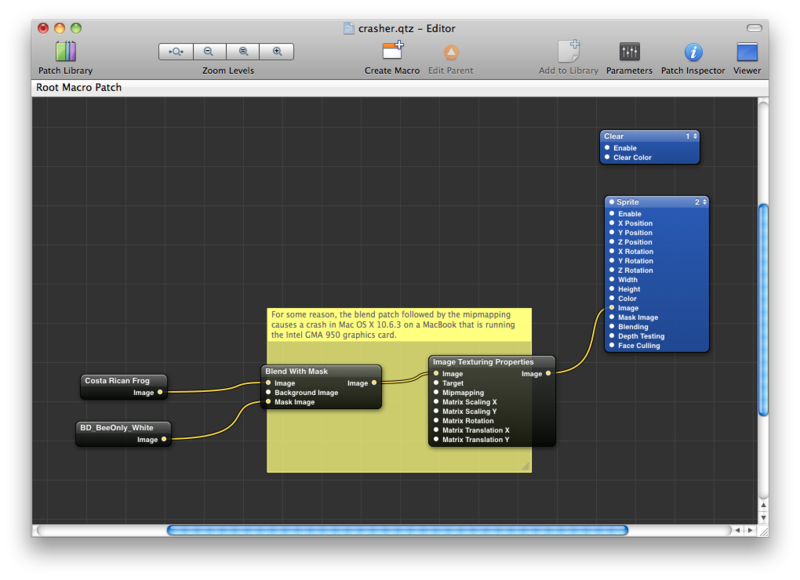 I have created two very simple Quartz Composer documents that demonstrate the problem. One of them blends two images and then displays the result with a mipmap. The other example crops one image and displays it, then displays a second image with a mipmap. If you would like, you can download the examples here. I filed this information as a bug report for Apple several weeks ago and have made sure that my contacts there know about it. Hopefully Apple will release a fix at some point in the future. Unfortunately, I have no idea if/when Apple will release a fix (and even if I did, I wouldn't be allowed to share that). If you are a customer experiencing this problem, you are welcome to transfer your license to a machine with a different type of graphics card, downgrade your Mac to 10.6.1 (10.6.2 had a different graphics bug), or wait until there is a fix from Apple. Sorry for the inconvenience. Thanks for the update Adam. Hope Apple fix this and soon as it is ruining my lessons!